Many of you will fondly recognize our guest today. 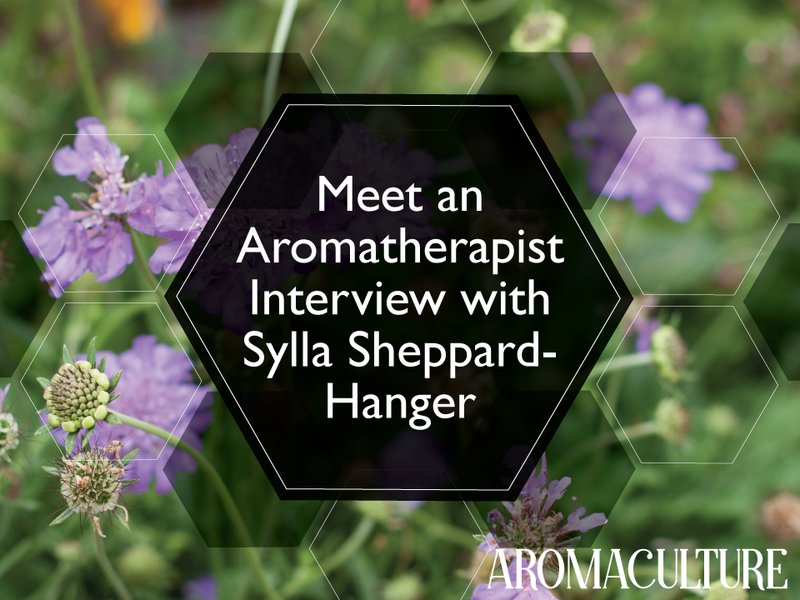 Sylla Sheppard-Hanger, aromatherapist, essential oil safety advocate, and educator-extraordinaire, is no stranger to the aromatherapy community and we're blessed to be able to share our recent interview with you here on the blog this week! Sylla Sheppard-Hanger has 40-some years of experience and personal research into bodywork and essential oils as a Natural Health Care Practitioner, licensed Massage Therapist, Aromatherapist, and licensed Cosmetologist. Her fascination with aromatherapy has led her to study with some of the most knowledgeable people in the field of aromatic and medicinal plants, essential oil research, and herbology. In 1993, she completed the Medicinal and Aromatic Plants Program at Purdue University in Indiana, and continued to complete the International Training in Essential Oils: Advanced Studies - Parts 1 & 2 (1996-7). She was a founding member of the American Aromatherapy Association (1988) and served two terms on the Board of Directors. She is the Founder and Director of the Atlantic Institute of Aromatherapy (Tampa, Florida) and author of The Aromatic Spa Book (2007), The Aromatic Mind Book (2008), The Aromatherapy Practitioner Correspondence Course, and the Aromatherapy Practitioner Reference Manual (1995). Sylla founded and directed the volunteer team for the United Aromatherapy Effort, Inc. (UAE), a non-profit charity whose mission is the collection and dissemination of donated aromatherapy products and chair massage to those affected during critical incidents and emergency work. Sylla worked closely with Dr. Trevor Stokes of the University of South Florida in their Psychosocial Aromatherapy Research Project (PARP) using aroma in children with autism and other disorders. She teaches and consults with companies needing help; and she maintains a private Aromatherapy practice (as a licensed massage therapist and cosmetologist) in Tampa, Florida, where she resides with her husband and one cat. Hi Sylla! Thanks for being here with us today. Could you start by telling us a bit about who you are, where our readers can find you, and what you are doing in the aromatherapy industry right now? Thank you for this opportunity! I started in the 1970's when I first found essential oils and added them to my massage practice. I actually thought I invented something but soon found out others had the same ideas. It all started on the quintessential “hippy road trip,” during which I ran across a fragrance shop for the first time. It was love at first scent (and sight­ — I love those little glass bottles). That love became an obsession with personal scents and I developed one for myself that I still wear to this day. Those who know me know me by scent, even when I’m no longer there. From there, I moved into licensed massage therapy and began to incorporate fragrances into my massages. The effects on clients sometimes astounded me! My lifelong obsession with aromas, essential oils, and positive effects was cemented. Today, I work in several aspects of the industry. From teaching to researching, editing for peers to client consultations — I am very active within the aromatic world and have a driving desire to encourage safe use on a global level. You can read that whole story of my aromatic birth here. When did you start working with essential oils? What was it about them that inspired you? Like many people, essential oils changed my life from the moment I first smelled some way back in the mid-1970’s. When I added them to my massage treatments, clients experienced amazing relaxation; when I made my own personal perfume, I felt complete. It became my signature scent that I still am known by today, 40 years later. Which teachers or mentors have been the most influential in your aromatherapy journey? Like so many in this industry, I began by reading anything I could. Of course, in those early days, finished quality reading material was harder to find. After I’d read all I could and incorporatedthat material into my practice, I searched for further education. I found Kurt Schnaubelt and the Pacific Institute of Aromatherapy and enrolled in (and completed) the program there. I loved their conferences. Oh, the joy of gathering together with like minds and learning from others! Kurt and Monica were the first to bring many aromatherapists to America for those conferences — I heard from people like Tisserand, Penoël, and Franchomme. Great days, those were! I talk more about those first days in my education here. Was there ever a specific situation that led you to an, "Oh, this really works!" moment? My first healing experience of treating a bedsore wound with lavender. Helping one person to relax in order to pass away in peace, soon after diffusion. My own healing experience during radiation treatment for breast cancer and feelings during my breast cancer journey (link below). Finally, a testament to daily diffusion: it is rare that either I or my husband catch a flu, virus, or other contagious illnesses, even though we both work around lots of people. He totally attributes that to living with me and the oils all these years; our home is protected!! So, our having no major illness from airborne germs because of diffusion is a big one. I must say, though, that one of the most amazing things is seeing the “This really works” moment. Watching someone have a complete breakthrough in thinking just by smelling an oil or blend or having a complete emotional release (cry, laugh, etc) — that is something I’ve always loved. My daughter, Nyssa, and I say in our classes that the class is not successful unless someone cries. And most often, someone does, even us. My journey combining complementary aromatherapy with radiation is a free download here (put it in the cart, then check out - use credit card 0000, leave expiration as is, and fill out other information as usual). Can you tell us a bit about your own pursuit of aromatherapy education? I first took the Pacific Institute of Aromatherapy course in the early 1980s, then wrote my own Aromatherapy Practitioner Home Study Course to fill in the gaps for practitioners as I found the course lacking that part. I attended every class, conference, and meeting I could find in those days before the internet. Some of that is chronicled in the link below. As a Founding Member of the first American Aromatherapy Association, I met all the leaders in the field. Later, I attended Purdue University for several programs on Medicinal and Aromatic Plants, including the two-part Essential Oils Program with Dr. Jim Simon. I studied with Martin Watt in person and over distance, first published his Plant Aromatics and brought him to the United States of America. Tony Burfield helped me with scientific editing for my courses and I published his Natural Aromatics Odours and Origins (both the first and, more recently, second editions) which taught me more. I’ve repeatedly teamed up with Dr. Robert Pappas and have sponsored classes and collaborated on papers with him for many years. I also attended a fascinating summer program on plant classifications at Cambridge University (UK). They have all the plant families in separate beds there! I hosted and studied with Robbi Zeck and the Blossoming Heart classes. Gabriel Mojay has been a big influence as a personal friend and colleague and a joy to host in classes here in Tampa. Most recently, I attended Mark Webb’s 8-day Medical Aromatherapy class in Atlanta. A full listing of all the courses I’ve taken can be found here. One thing aromatherapists have in common is an endless thirst for continued education in our field. What are some of the ways you are continuing your own education? Besides attending most Alliance of International Aromatherapists and National Association for Holistic Aromatherapy conferences, I enjoy attending classes like the Aromatic Medicine above. Editing Tony Burfield’s Natural Aromatics Odours and Origins, Second Edition has been a continuing education for me and my daughter for the last year. In addition, I’m regularly updating my own course materials and creating new courses is education. Aside from all of that, I enjoy the informative parts of social media (Facebook/LinkedIn) for leads on new studies and updated information. What does a typical day or week as an aromatherapist look like for you? Today it is scattered regular clients and some online mentoring in our Student Forum. For the last year, spare moments were spent working on editing and publishing Tony Burfield’s second edition; since Nyssa and I are also creating a new beginner course, we are writing sections for this. In addition, throughout the last few years, I have been working with new companies/individuals - consulting, creating blends, etc. (such as the Kids line for Eden’s Garden). What do you enjoy most about being an aromatherapist? I love daily work with the oils — making a new blend or just using them in my own self-care, for diffusion, etc. Mostly I enjoy making changes in people’s lives so simply and pleasantly, and sharing with others the simplicity and pleasure of living with essential oils. I recently gave a diffuser and oils to a friend’s mom who is house-bound — her life is much more pleasant and healthier with it! What is one of the most challenging things about being an aromatherapist? When I started 40 yrs ago, there were no courses or qualifications or titles for people taking courses. We have had to create this in our industry, and even still today, they are varied and inconsistent; from Aromatherapy Practitioner to Certified Aromatherapist, with training time varying from a simple weekend to years of study. The national organizations have their standard requirements for members, but that leaves out the rest of the world. Our working vision is to get the Registered Aromatherapist designation in place — for this, people can take an independent exam (regardless of which accepted course they choose) and receive the title Registered Aromatherapist. Right now, this remains our only designation with a standard, yet it needs new volunteer input and some changes to reflect what Aromatherapists really want. So the acceptance and embracing of aromatherapy or aromatic medicine in holistic health care is happening, but slowly, and this is good to see. However, the other issue is battling the constant unsafe info being generated by the masses on the internet. Is there a particular aspect of aromatherapy that you are passionate about? Safety!! As former chair of The National Association for Holistic Aromatherapy Safety Committee (unfortunately now defunct), I developed a passion for stressing safe use — due to the tremendous amount of reports of injuries caused by unsafe advice since about the mid 1980’s. We had never had to deal with this issue before the unsafe advice started being spread. This led to the collection of injury reports we still now collect. The collection has begun to reveal the degree of less safe use and the need for safety education at a mass level. It also points to the validity of a class action lawsuit being looked into. Which essential oils are you finding yourself working with most often lately? Lately, I have used what I call the breather oils (conifers/citrus), partly because I love the fresh clean smell and because my oak trees are full of pollen. Since pollen doesn’t help my breathing issues, I am preventing the issues by staying inside! Also I have been playing more with new CO2 extractions, most recently, the Rosemary ct. verbenone, which has always been a favorite! What advice would you give to someone who is considering a career in the aromatherapy industry? Find the most relevant school and teachers to get your initial education; look for teachers who may share your field, especially those that are still practicing therapists themselves. Look for those who are still learning themselves. Look for schools that have a long history of specialty education in aromatherapy. Check out the school and teachers’ accomplishments over the years: are they active in the industry? How long have they been teaching? Look for those with high regard in the field and courses that are approved by the national organizations. And . . . never stop learning! I hope you've enjoyed getting to know our guest a bit more today. Have a lovely week! Don't worry - we hate spam too. We respect your privacy and you are free to opt out at any time.